The younger Bush may impress foreign leaders just because he’s not his brother—but that’s not enough. Over the weekend the Washington Post reported on the state of Jeb Bush’s nascent president bid and painted a picture of a campaign that is in a state of panic. And for good reason. In six months Jeb has revealed himself to be a candidate who is not only hindered by his last name, but also by what has, so far anyway, been a clumsy and awkward performance on the campaign trail. 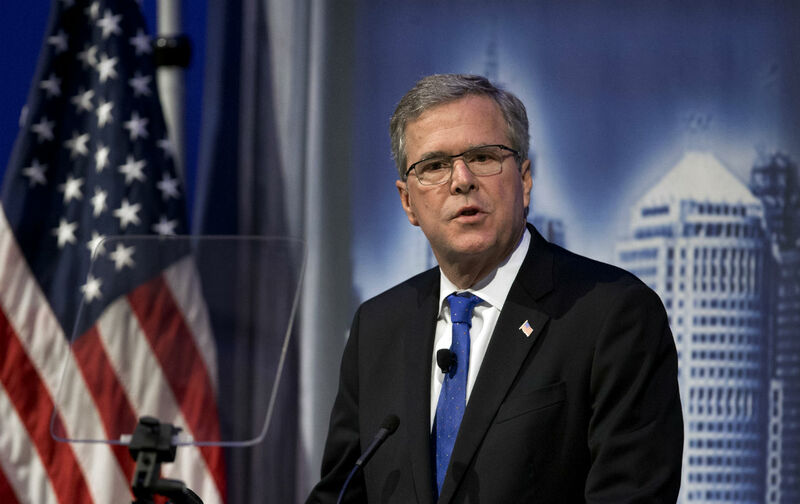 Like his older brother, Jeb struggles mightily with his native tongue. He also seems to have a hopelessly disjointed approach to foreign affairs. In desperate search of a foreign policy credential, Mr. Bush traveled to several Eastern European capitals last week, where, it was said, he impressed his interlocutors by the fact that he wasn’t his brother. So far, it seems that all Jeb Bush has shown us is that he's not his brother. The bar for what would constitute a “successful” European sojourn for Bush was set exceedingly low. According to the New York Times Mr. Bush, after having sat through a “dense presentation” on the Ukrainian economy, asked his hosts: What is the retirement age in Ukraine? For this rather, well, basic policy inquiry Mr. Bush was judged to be “very astute” in The Paper of Record. Its almost as if he has a devil (Brother George) on one shoulder and a better angel of his nature (Father George) on the other. Yet given his prior pronouncements and his choice of advisers (which include, among others, the arch-neocons Paul Wolfowitz and Otto Reich) realists should not delude themselves which, angel or devil, has the candidate’s ear. It was, for the most part, a typically milquetoast performance, and the speech itself was the usual Republican brew of “pro-family” and “pro-military” banalities interspersed with the occasional jab at both the President and the Democratic frontrunner. In any event, one can’t help but come away from Bush’s European tour and his speech on Monday wondering why it is Mr. Bush believes he should be President, and, more to point, why anyone else thinks he should be.